With over 25 years of experience, our expert jeweler can do your repairs while you wait and browse our showroom. Our complete range of jewelry repairs includes prong, mounting, setting, and shank repair; re­cutting, replacement, repair, and refurbishing of gemstones; pearl restringing and re­knotting; replacement of clasps, hinges, and rivets; refinishing or re­plating of all precious metals; and chain repair. 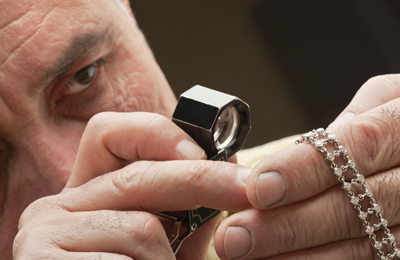 Our expert jewelers can also restore and alter old and worn out pieces to their former glory. Our experience with all kinds of metals and style. Our team of expert jewel craftsmen will help you design a jewel piece that exceeds your expectations. We will guide you in every step of the way. From concept to final production, your total satisfaction is our highest priority. In our shop, our Watchmaker can handle everything from a simple battery change, while you wait, to complete overhauls of all types of quartz and mechanical watches, watchband sizing and adjustments, new straps and bracelets, link removal, timing calibration, stem/crown replacement, movement replacement and case repair.